The “Counsel” title has expanded to accommodate the changing practice of law. Traditionally, this title was given to senior partners and politicians — setting up a mutually beneficial relationship that allowed the firm to continue to serve as the runway for some or the reintroduction back into private practice for others. Within the last decade, the position has broadened into a permanent title for many attorneys who are more senior than associates but for whom the firm does not have room in the partnership. The “Counsel” role is a promotion for many associates whose strength is in their technical ability. The role is also an option to evaluate lateral hires before elevating them to partner. The “Counsel” role is also seen more and more for lateral attorney hiring. Why bring on an attorney as a counsel instead of partner? The hiring firm routinely requires that the partner brings a book of business, typically summed up as “portables.” Some homegrown partners (or senior counsel passed over for partnership) may also feel that resources were too generously allocated to bringing on lateral partners who did not meet expectations, so counsel is a safer bet internally to justify some new lateral hires where the business case is not based on portables. Another significant reason we are seeing more counsel-level hires is because firms are hiring for counsel-level positions. Counsel to counsel is a new kind of lateral hire. This latter observation suggests that many firms today have three main categories of attorneys: associate, counsel, and partner (with partner oftentimes broken into income and equity tiers). Though connotations of the counsel title differ greatly from firm to firm, it is becoming clear that more and more firms are treating counsels as de facto non-equity partners, with no up or out expectation. In 2015 year to date, 1,244 counsels have lateraled within the Am Law 200. These laterals account for 15.5% of the total moves so far this year. 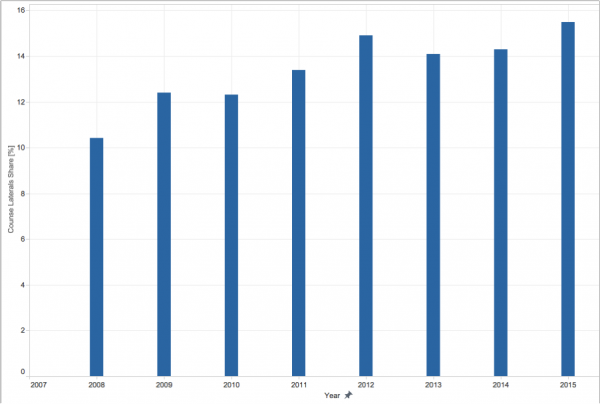 Counsel’s share of the lateral market is up 50% for the same period in 2008, and 8.4% from the same period last year. What is even more remarkable is the source for these laterals. Traditionally, the counsel position is a transitional role either into a partnership or into retirement. The classes of counsels could be split into three: a trial period for associates, a special arrangement with a senior attorney from government or corporate positions, and a soft transition into retirement or semi-retirement for partners near the mandatory retirement age. Though these three roles are still commonly found in Biglaw, the counsel position is now a well defined and permanent position. 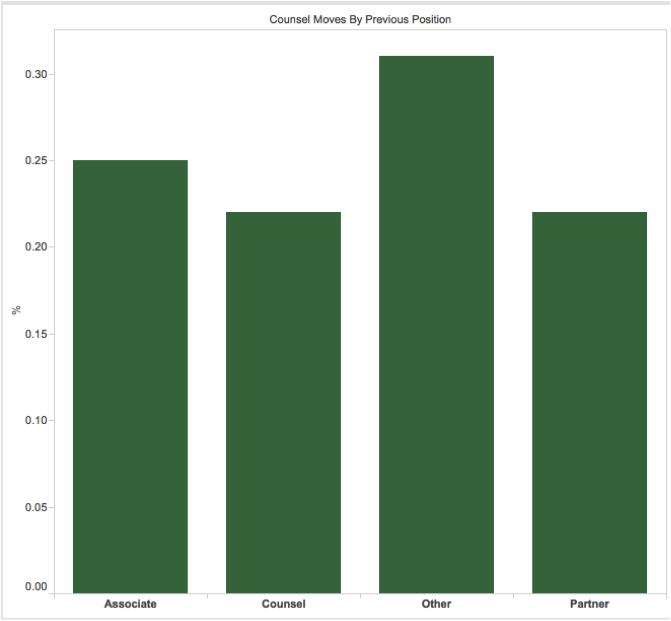 By randomly sampling 100 lateral moves into counsel positions in 2015, we found that around 22% of these counsel moves were from attorneys leaving another counsel position. Comparatively, there were an equal number of partners transitioning to the counsel role over this period. The “other” category, characterized by those who entered/re-entered Biglaw from governmental or corporate positions, lateralled the most out of any group. This group is split fairly evenly between governmental and corporate positions. 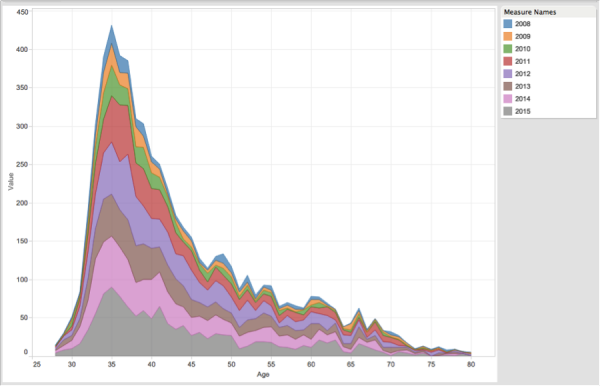 There is a large spike in the number of counsels at age 35 and 36. The distribution of partner ages also grows here as well but continues growing rapidly as the distribution of counsel decreases after 36. This observation suggests that many of these counsels are making partner. The latest promotion report backs this inference. Of attorneys promoted to partner this year, approximately 38% were counsels before their promotion. If counsel positions were simply transitional roles, then we would expect to see the number disappear after partnership prospects were denied and before mandatory retirement has been reached. Instead the ranks stabilize and likely will continue to as firms look at counsel as a permanent class of attorneys. 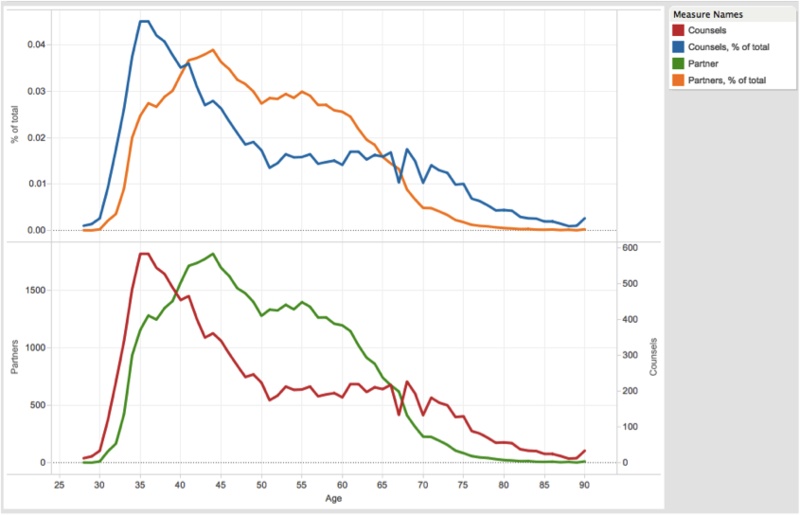 If we divide up the lateral counsel moves by year and by age, we start to see a significant trend. From 2008-2010, counsel moves were predominately junior; counsel movement was almost nonexistent after 40. From 2011 to today, firms seem much more willing to accept counsel laterals from 40-55 years old—well before the mandatory retirement age, and well after associates and counsels are typically promoted to partner.